One stark feature of the global economy in the 21st century is the ongoing slowdown of productivity growth. This column explores the key factors behind this trend for several countries around the world. Weak demand is found to be a critical driver of the slowdown by holding back investment and changing the structure of consumption baskets, and through economies of scale effects. Although digitisation offers a potential way back, its benefits will require a strengthening of aggregate demand. 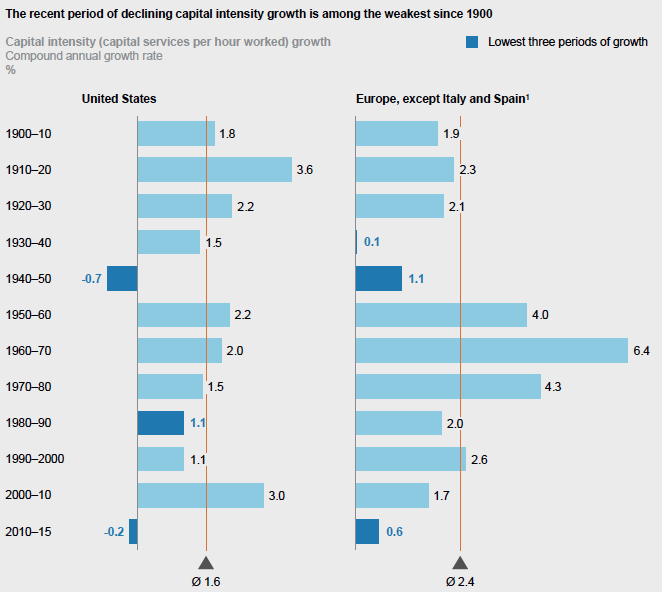 Labour productivity growth remains near historic lows in the US and much of Western Europe. While growth in labour productivity has been slowing since the 1960s in many of these countries, the recent two-percentage point average drop, partly preceding and partly following the Global Crisis, is particularly troubling. Many competing explanations have been put forward for this deterioration. They include the role of mismeasurement (Byrne et al. 2016, Syverson 2016, Hatzius et al. 2016), financial crisis-related effects (such as weak balance sheets, credit constraints, zombie firms, and capital misallocation), or weak aggregate demand and rising uncertainty (Adler et al. 2017, Borio et al. 2016, Gopinath et al. 2017, McGowan et al. 2017). Structural shifts also feature prominently as contributing factors, including the significantly reduced pace of technological innovation (Gordon 2016), the maturation of global supply chains (Adler et al. 2017), a shift to services (Turner 2017), changing industry structure and dynamics (Andrews et al. 2016, Decker et al. 2016, Haltiwanger 2012, Grullon et al. 2016), secular stagnation, and a structural savings glut (Summers 2016). In a recent report that we co-authored, we try to pinpoint which explanations matter most in the productivity growth slowdown during the period after the financial crisis (Remes et al. 2018). While many elements play a role, looking at the big picture, we find that about half of the recent drop in productivity growth is from weak demand, particularly in Europe (Remes et al. 2018). 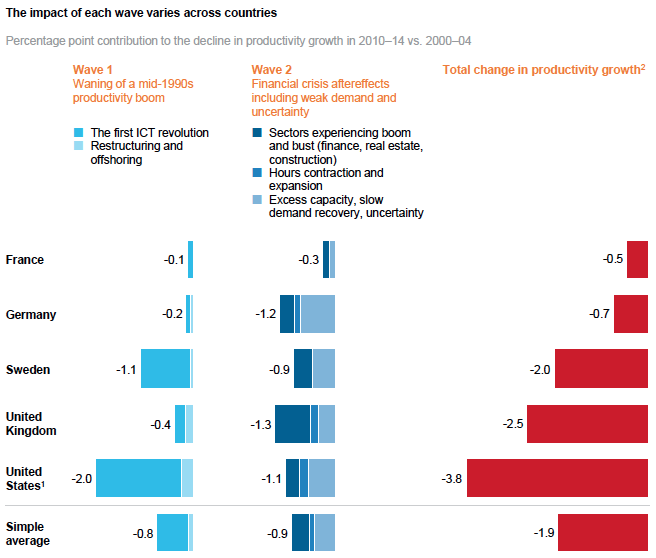 The other half, and a more significant factor in the US, was the waning of the productivity boom that began in the mid-1990s with the first information and communications technology (ICT) revolution, also supporting the subsequent phase of restructuring and offshoring (see Figure 1). Notes: 1 US data are for the private business sector only; Europe data are for the total economy. 2 Total change in productivity growth also includes the impact of reallocation (share of total labor and relative price movement) across sectors (“mix effect”) and sectors not considered in our analysis. May include some of the impact from transition costs of digital. For further details. see technical appendix. Italy and Spain are excluded from this analysis because their productivity growth between these time periods did not decrease. We did not attempt to size the impact from Wave 3 (Digitization). While digitization contains the promise of significant productivity-boosting opportunities, it comes with lag effects and adoption barriers as well as transition costs. The net effect on productivity is unclear. Numbers may not sum due to rounding. Source: EU KLEMS (2016 release); BLS Multifactor Productivity database (2016 release); McKinsey Global Institute analysis. Despite unusually strong employment growth, capital expenditures remained lacklustre (see Figure 2). Given an environment of low demand as well as ample capacity, there was no reason to boost investment. In particular, expenditures for equipment and structures fell significantly (while, notably, it kept growing in intangibles). This is especially evident in Spain, the UK, and the US – the three countries with the biggest real estate boom prior to the crisis. For example, investment in structures – including by companies as well as household investment in residential real estate – fell 23% and 26% between 2007 and 2009 in the US and the UK, respectively, in real terms. While gross investment as a share of GPD has been slowly inching up during the recovery, mediocre demand perspectives mean that, from a firm perspective, there is no incentive to add to the stock of existing equipment. Capital intensity growth is still at the weakest rate since WWII. And longer term, a pronounced shift in investment to faster-lived (and ever less expensive) software and other intangibles has additionally contributed to a decline in net fixed capital formation rates. Net capital accumulation, as a share of GDP, fell by more than 4 percentage points (2010-14 average versus 1985-89) in most countries analysed. In that context, it did not help that, in particular, public sector investment in core infrastructures has been scaled back, too. In fact, in some countries we actually find long-lasting net public sector disinvestment, which will translate into increased maintenance costs down the road. From the perspective of firms, this means higher user costs of capital. 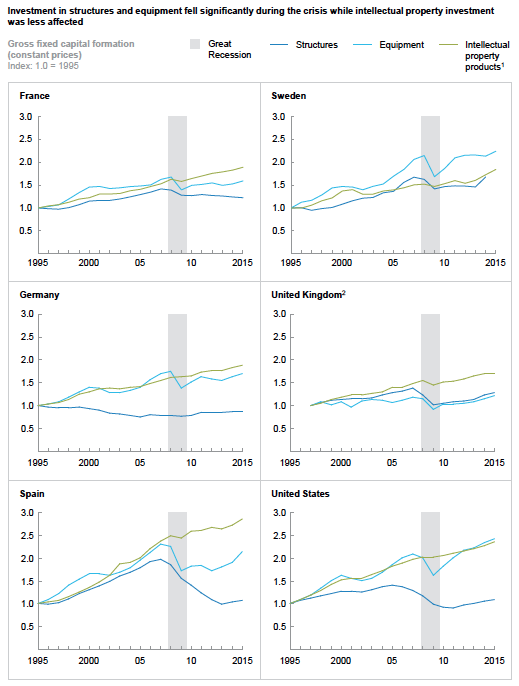 France, Germany, Italy, Spain, Sweden, the UK, and the US all experienced a longer-term decline of between 0.5 and 1 percentage points in public investment between the 1980s and early 2000s, and it has been roughly flat (or even decreasing) since then. Notes: 1 Simple average of France, Germany, Sweden, and the United Kingdom. Italy and Spain excluded since their labor productivity trends are different from those of other European countries. Source: A. Bergeaud, G. Cette, and R. Lecat, "Productivity trends in advanced countries between 1890 and 2012," Review of Income and Wealth, volume 62, number 3, 2016; McKinsey Global Institute analysis. The lack of a robust demand perspective has been a key constraint on firms’ propensity to invest (see Figure 3). We have found from our global surveys of business that 47% of companies that are increasing their investment budgets are doing so because of an increase in expected demand. Concurrently, uncertainty plays a pronounced role in holding back investment, theoretically raising hurdle rates (the required return on equity). On the other hand, financial constraints – access to and costs of funds – apparently, at least amongst our sample of firms, do not feature highly. Across our industry sectors, we find that weak sales in the wake of the financial crisis was a key factor holding back capital expenditures. At the same time, when demand started to recover protractedly, most industries had ample capacity and room to expand without needing to add to existing equipment and structures. Notes: 1 “Computer software and databases,” “Research and development,” and “Other intellectual property products.” 2 UK data starts in 1997 due to data availability and is indexed to that year. Source: OECD (November 2017); EU KLEMS (2017 release) for United Kingdom only due to data availability; McKinsey Global Institute analysis. In addition to holding back investment, weak demand has also dragged productivity growth down through economies of scale effects. In finance, for example, productivity-growth declined – particularly in Spain, the UK, and the US – due to contractions in lending volumes (banks’ output), which banks were unable to fully offset with staff cuts due to labour as a quasi-fixed input (for example, to support branch networks and IT infrastructure). In the same vein, the utilities sector, which has seen flattening demand due to substantial efforts at increasing energy efficiency as well as declining economic activity during the crisis, was similarly not able to downsize labour. The need to support electricity distribution and the grid infrastructure requires a minimum amount of labour input. We find a third way that demand has hurt productivity growth: through the changing structure of consumption baskets. For example, consumer preferences boosted productivity growth in both the auto and retail sectors from the mid-1990s to the mid-2000s, through a shift to higher value-per-unit, more effective-to-produce goods. In the meantime, that trend has slowed. In the early 2000s, the German and US auto sectors experienced a trend of customers purchasing SUVs and premium vehicles (i.e. higher value-added products). This boosted productivity growth by 0.4–0.5 percentage points in the auto sector during that period. That trend has slowed in both countries, which might be welcome for environmental reasons. Similarly, in retail, we estimate that consumers shifting to higher-value goods (e.g. higher-value wines or other premium products) contributed 45% to the 1995–2000 retail productivity growth increase in the US. This subsequently waned, also dragging down productivity growth. The reasons behind the recent decline in productivity growth suggest that they are not entirely structural – as the financial crisis after-effects continue to dissipate, we expect productivity growth to recover (quasi-mechanically) from current lows across sectors and countries. On top of this, the good news is that our sector analysis reveals significant potential to boost productivity growth from a continuation of more typical productivity opportunities (such as operational efficiency gains), though mostly from the diffusion of digital technologies – themselves relying on the first ICT boom. Overall, we estimate that the productivity-boosting opportunities could be about 2% per year over the next ten years in Europe and the US, with the main part (60%) coming from the diffusion of digital opportunities. However, leakages may challenge the realisation of this ‘digitised demand’ potential. While we found that weak demand hurt productivity growth in the aftermath of the financial crisis, looking ahead, there is concern that some demand drags may be more structural – or secular – than purely crisis-related. Broad-based income growth has diverged from productivity growth for a long while now. A declining labour share of income and a rising trend in income inequality have been eroding median wage growth. Moreover, the rapidly rising costs of housing exert a dampening effect on consumer purchasing power. It appears increasingly difficult to make up for weak consumer spending (of largely liquidity-constrained households) via higher investment. Of course, that very investment is influenced, first and foremost, by aggregate demand. In addition, rising returns on investment discourage capital expenditures relative to dividends. Demographic trends may further diminish investment needs through an ageing population having less need for residential and infrastructure investment. These demand drags are occurring while interest rates –endogenously reflecting expected mediocre growth perspectives – are hovering near the zero lower bound. All of this holds back the pace at which capital per worker increases, impacts company incentives to innovate, and thus puts a structural damper on productivity growth. In a low-pressure economy, the virtuous circle does not get under way. The potential from digitisation may not materialise fully, and may further amplify demand leakages. First, as we have learned from previous technology revolutions, it often takes time for technological diffusion to translate into productivity (Oulton 2002). Given the disruptive nature of digitisation (Bughin and van Zeebroeck 2017), the adjustment costs are possibly higher with digital technologies than previously thought, and might significantly weigh on total added value; for example, we find that cannibalisation of incumbent revenues by new digital players put material pressure on nominal demand. Second, digitisation may exacerbate demand effects, especially if the diffusion of digital technologies concentrates less on innovation than on pure technical automation that would compress the labour share of income and increase income inequality, by hollowing out middle-class jobs and polarising the labour market into ‘superstars’ versus the rest. Unless displaced labour can find new, highly productive (and thus high-wage) occupations, workers may end up in low-income occupations that, in a self-reinforcing manner, create a further drag on demand, limiting average productivity growth. Supporting worker training (i.e. permanent education) to ensure that periods of transition do not disrupt incomes. The productivity option holds out the promise of a big payoff. It would return advanced economies to robust economic health and promote widespread prosperity for years to come. Adler, G et al. (2017), “Gone with the headwinds: Global productivity”, IMF Staff Discussion Note 17/04. Andrews et al. (2016), “The best versus the rest: The global productivity slowdown, divergence across firms and the role of public policy”, OECD, Productivity working papers 05. Baldwin, R (2017), The Great Convergence: Information Technology and the New Globalization, The Belknap Press of Harvard University. Borio, Claudio et al. (2016), “Labor reallocation and productivity dynamics: Financial causes, real consequences”, Bank for International Settlements, BIS working paper number 534. Bughin, J and N van Zeebroeck (2017), “The best response to digital disruption”, Sloan Management Review Summer. Byrne, D M, J G Fernald and M B Reinsdorf (2016), “Does the United States have a productivity slowdown or a measurement problem?” Federal Reserve Bank of San Francisco, working paper 2016-03. Decker, R A, et al. (2016), "Declining business dynamism: Implications for productivity", Brookings Institution, September. Gopinath, G, et al. (2017), “Capital allocation and productivity in Southern Europe”, NBER Working Paper No. 21453. Gordon, R J (2016), The rise and fall of American growth: The US standard of living since the Civil War, Princeton University Press. Grullon, G, et al. (2016), "Are US industries becoming more concentrated? ", October. Haltiwanger, J (2012), “Job creation and firm dynamics in the United States”, Innovation Policy and the Economy 12(1). Hatzius, J, et al. (2016), “Productivity paradox v2.0 revisited”, US Economics Analyst, Goldman Sachs, September. Jorgenson, D (2018), "Productivity and Economic Growth in the World Economy", International Productivity Monitor. McGowan et al. (2017), “The walking dead? Zombie firms and productivity performance in OECD countries”, OECD, Economics department working papers 1372. Oulton, N (2002), "ICT and productivity growth in the United Kingdom", Oxford Review of Economic Policy 18(3): 363–379. Remes, J, J Manyika, J Bughin, J Woetzel, J Mischke and M Krishnan (2018), Solving the productivity puzzle, The role of demand and the promise of digitization, McKinsey Global Institute, February. Summers, L H (2016), “The age of secular stagnation: What it is and what to do about it”, Foreign Affairs, 15 February. Syverson, C (2016), “Challenges to mismeasurement explanations for the US productivity slowdown”, NBER, working paper 21974. Turner, A (2017), “Is productivity growth becoming irrelevant?”, Project Syndicate, July. Woetzel et al. (2016), Bridging global infrastructure gaps, McKinsey Global Institute, June. McKinsey Quarterly survey, March 2017.